I spent a lot of time knitting this weekend. I don’t have a lot to show for it. But I’m not frustrated (surprisingly!). I’ve been really wanting to make myself a pair of knee highs from Regia Inspiration 32. Last summer I started out making 4332, but it just wasn’t meant to be. I still like the pattern but I don’t want to knit it now. So I picked up some Louet Gems Opal in Pink Panther from my LYS on Sunday. I picked pattern 4334 — it has hearts going up the outside of the socks. I figure if they’re going to be pink they might as well have hearts on them too. The yarn is a heavier weight than what’s called for in the pattern so I did some math and cast on. I knit through the ribbing and tried it on. Waaaaaay too big. So I ripped and tried again. 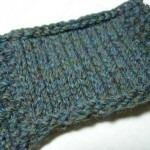 This time I knit through the ribbing and the first 6 rows of the patterning. Tried it on again. Guess what? Still too big. Not huge though. It was big, but in a way that had me negotiating with myself. Is it really too big? What if I thread through some clear elastic thread when I’m done? Knee highs always slip down anyway. But in the end I ripped that start too. While I was at it I decided to do them toe-up. I like toe-up so much better. I know how big the feet should be, and this way I’ll just follow EZ’s method for making knee highs (or as she refers to them — stockings). Doesn’t stockings sound more refined than knee highs? Or is it me? I hear knee high and I think grandmas in house dresses with socks rolled down to the ankles. First, you need to know roughly what gauge you’re going to get. I knew for my gauge I’d have to have 48 stitches around the foot. So, cast on half the total stitches (in my case, 24). I use the figure 8 toe. An important note here is that I also use 2 circs. I love figure 8 with circs. I abhor figure 8 with DPNs. Another important note is that figure 8 looks really wonky when you knit the first row. Don’t sweat it though! After I knit the whole toe I go back and work out the excess yarn toward the yarn tail. Oh yeah, about that yarn tail. I don’t start with a slip knot. If you do you’ll have a problem working the excess out to the end. So I simply put the yarn over the needle and twist the ends around each other below the needle. Then I hold onto the free end with my right hand while I figure 8 with the left. I’m not sure if that makes sense. Should I take a pic for next time? OK, so once I’ve cast on half the stitches I knit 1 row plain. So, still 24 stitches. Then, I start the increases on every row. It’s the basic toe increases, but no plain rows in between. I increase 1 stitch in from the edge of each needle. What kind of increase to use? I like the look of backward loop the best. BUT. I really don’t like struggling with knitting into the backward loops on the next rows. So recently I’ve started this. When I need to do the increase I do a plain old everyday YO in its place. 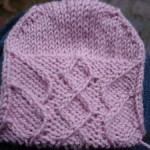 Then, when I get to the point where I need to knit that YO, I knit it twisted, which creates the same kind of stitch as the backward loop method. It works better for me. If you’re fine with backward loop knitting just stick with it. Whatever works. Now, I keep increasing on every row until I have about 85% of the total stitches needed. 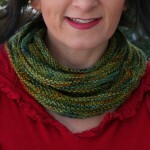 In this example I stopped at 40 stitches. Then, I went to the classic knit a plain row, knit an increase row. When I got to 48 I was done. This made my nicely rounded toe. Since I was increasing faster, it also made a shallow toe, which didn’t even quite get to the base of my pinky toe. So, even though my sock foot has patterning on it I did another 4 plain rows before starting the patterning. Once I got to that point I started my patterning, which is 4 rows of K1tbl, P1 followed by 4 rows of P1, K1tbl. I love K1tbl — so neat and tidy. Some of you may be wondering what I’m going to be doing about those cables since the chart was written going down the leg. Those of you who know me know I won’t be putting upside down hearts on them. My theory is that if I put the chart upside down it will work. There are no special increase or decrease rows in the chart (everything is just cables or travelling stitches) so I think this will work. And if it doesn’t? Well, it’ll just be another chapter in the neverending saga to knit a cabled knee high stocking. Great rounded toe tutorial. I just saw on someones blog some socks with the rounded toe and loved it. My next pair just may have to have it. I adore the color! We have NO Gems available in this area. 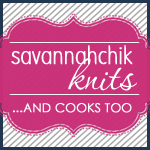 I knit with it for Nancy Bush’s new book and loved it. Gotta get some! thanks for the toe information! 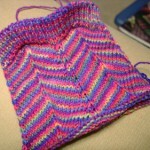 i just started my first toe up sock for kevin… the first attempt had an odd pouch at the top. i had finished the increases and there was no way i was ripping and doing them again… so I ripped out the pouch and kitchnered it, it looks ok… the next pair i do will definitely be using your method!! Perfecting the toe is an important art. I’ve always thought a lot of sock patterns have toes that are too angled and pointy. I usually do socks cuff down, but I’ll have to try this figure 8 toe up method. Thanks for the info! What a mighty nice rounded toe you have there! My sock toes up until now have been pretty triangular. I’ll have to try your method! The explanation is very clear! Thanks, Jody!